Sunday 26th will also offer a parade run, and some demonstration runs over the lunch hour and between timed runs of the hill. To apply for the parade run, visit the Plymouth Motor Club website. Demonstration runs will include a Subaru World Rally Car and a Mercedes Streamliner. 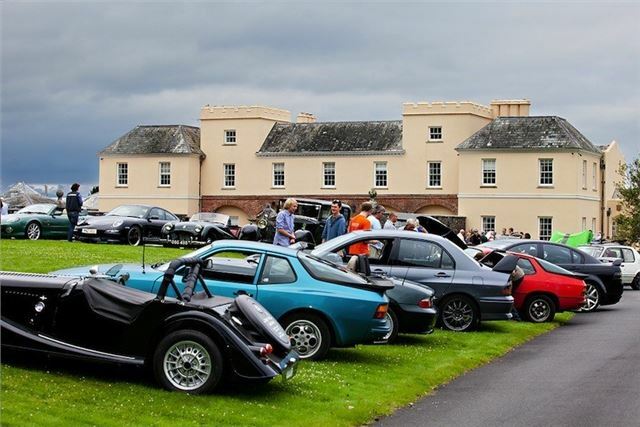 There will be the chance to see plenty of classic, performance and rare cars, take a 4x4 for a drive around the estate with Land Rover Experience West Country and Roger Young Land Rover, have a go at clay pigeon shooting, drive a simulator and sample some fine West Country food and drink. “As a self-confessed petrol head, I am thrilled to be involved with the Pentillie Festival of Speed. It promises to be fuelled by action and very exciting,” said joint-organiser, Stuart James, Plymouth Motor Club. Pre-booked tickets cost £10 (per day) for adults and £5 (per day) for children (under 5’s free) when booked via the Pentillie Festival of Speed website: www.pentilliefestivalofspeed.co.uk before the 3rd August. After 3rd August, tickets will only be available on the gate at £12 (per day) for adults and £6 (per day) for children. Pentillie’s Festival of Speed has already had coverage in The Guardian, Telegraph and regional media. Event sponsors Vospers have taken over a paddock and will display all their current brands and latest models, including the Renault Twizzy. Event Sponsor Roger Young Land Rover and Land Rover Experience West Country will have all their current range on display, and will be offering diving experiences through the woods and estate. Car clubs and individuals with magnificent cars have applied for spaces within the display car park, through which all spectators must walk from the main car parks. Further entertainment will be provided by Giant Scalectrix, simulators of all kinds (F1, Moto-GP and linked chassis simulators), laser clay pigeon shooting, archery, live music from Swingology, a display from Para-jet and the jaw-dropping Abarth stunt plane flown by Mark Jefferies. There will be a dedicated children’s area with Play bus, bouncy castle, and old-fashioned sweetie stall, and a wide variety of trade stands showcasing clothing, art, household accessories, model yachts and millinery. Food and drink will be provided by Chandlers Bistro and Skinners Ales in conjunction with Castang Wines and Louis Roederer. Pimms and champagne will be on offer, as well as the specially brewed Pentillie Piston Broke Ale by Skinners. Plymouth Motor Club is in charge of the hill, and have taken all the entries for the hill climb, are managing the time keeping, marshall, scrutineering and the safety on the hill. There are great vantage points along almost the entire length of the hill climb, as the footpaths through the woods give you fantastic viewing from above the track. Places to look out for are the “hair pin corner” where competitors will have to brake hard on entry before hanging their back wheels out in the corner and smoking their tyres as they accelerate away. Cherry Pie benefits from the wonderful Grandstand that will over look it. It is a very tricky corner that will undoubtedly mean that some cars will take to the air! Some seats will be reserved for corporate tickets, although grandstand seats will be available on the day for £15 for an all day pass. To enter the hill climb you must have a non-race National-B licence from the MSA (Motor Sports Authority). Once you have this licence you can then apply via the Plymouth Motor Club to enter the hill climb. This must be done prior to the 5th August. Both hill climb days are already over-subscribed but please apply anyway (you will not be charged if you are not successful), but it will help with our event planning for 2013. If you have a historic, vintage, classic, performance or unique car – something that you would like to display for others to enjoy - then you can add it to the display car park. Spaces can be booked as an individual car, or with enough room for six or twelve cars for motor clubs. Motor bikes are also welcome to park in this area which has spectacular views of the Tamar Valley. There is a children’s play area with a Play bus, bouncy castle, face painting and old-fashioned sweetie shop, as well as Giant Scalectrix (bring your own scalectrix car and have a go), as well as a variety of simulators on site. A wide variety of accommodation is available locally, including a special Pentillie FoS package at the award-winning Pentillie Castle. Guests staying overnight will of course have free access to the event, as well as access to the castle and corporate area. They will have reserved seating in the grandstand, and all meals except dinner will be catered for in the Pentillie corporate area including a special Pentillie FoS breakfast, champagne lunch and afternoon tea in the castle too. See “where to stay” at www.pentilliefestivalofspeed.com for more details. If it rains, you will get wet – please dress appropriately and wear sensible footwear. The site is quite steep, so please make sure you are comfortable and are wearing shoes that will a) keep you comfortable all day, and b) be suitable for the woodland paths and fields. There will be some covered areas near the castle, and bars, but they are limited. Due to the site itself, disabled access is limited. There is a disabled parking area, with a wheelchair accessible mini-bus transferring people to the castle area. However, as the site is very spread out and quite steep, and the drive will be closed for much of the event due to the hill climb, it is definitely not one of the most accessible events. Disabled visitors will have half-price entry to the grandstand, but this will need to be booked in advance. No dogs are not allowed on site under any circumstances. This is an MSA ruling. Unfortunately, as there is no shade in the car parks we will have to turn cars away with dogs in them. Pentillie Castle offers nine luxurious en-suite bedrooms in a breathtaking setting overlooking the River Tamar and Dartmoor, was named a winner of the VisitEngland Awards for Excellence 2012 B&B category. Pentillie was built in 1698 and was remodelled into a castle by the architect William Wilkins, in collaboration with famous landscape designer Humphry Repton, in 1810. By 1965, however, the castle and estate had fallen into disrepair and returned to being a home. In January 2009, the Grade II listed Pentillie Castle featured on the Channel 4 series Country House Rescue, which publicised the estate’s plight nationally, leading to a turnaround in fortunes for this magical riverside estate and gardens.